We instigated a rubbish clearance policy in 1997 for the region and this has gone through several stages of improvements. The retreat has good quality drinkable spring water and we encouraged our guests to not use bottled water as it was unnecessary and plastic bottles are a major source of litter in the mountains particular from tourists. So in order to give our guests 100% confidence that our water was drinkable we equipped the retreat with water filters that are visibly on show to discourage the use of plastic bottled water. All supplies are purchased locally as much as possible and all staff are from the local region including the management, in fact 80% of our staff are within 2Km. As much as possible of the accommodation purchases are from the local area this includes both consumables for the running of the establishment and the materials and labour used in the construction process. We have also sponsored a "Tourist Code of good practise"
•	Limit deforestation – make no open fires and discourage others from doing so on your behalf. Where water is heated by scarce firewood, use as little as possible. When possible choose accommodation that uses kerosene/gas or fuel-efficient wood stoves. •	Remove litter, burn or bury paper and carry out all non-degradable litter. Imlil has a rubbish collection system - please assist and show good example by depositing litter in the bins. Graffiti are permanent examples of environmental pollution. •	Keep local water clean and avoid using pollutants such as detergents in streams or springs. If no toilet facilities are available, make sure you are at least 30 metres away from water sources, and bury or cover wastes. •	Plants should be left to flourish in their natural environment – taking cuttings, seeds and roots is illegal in many parts of the High Atlas. •	Help your guides and porters to follow conservation measures. •	When taking photographs, respect privacy - ask permission and use restraint. •	Respect religious and cultural places - preserve what you have come to see, never touch or remove religious objects. •	Giving to children encourages begging. A donation to a project, health center or school is a more constructive way to help. •	You will be accepted and welcomed if you follow local customs. Use only your right hand for eating and greeting. It is polite to use both hands when giving and receiving gifts. •	Respect for local etiquette earns you respect - loose, lightweight clothes are preferable to revealing shorts, short tops and tight fitting action wear. Hand holding or kissing in public is disliked by local people. •	Visitors who value local traditions encourage local pride and maintain local cultures, please help local people gain a realistic view of life in Western Countries. We only use mules whether ours or hired in that are in good health have Spana bits, are loaded with 60 to 80 kg of baggage and muleteers are discouraged/banned from riding when the mules are loaded. We worked with Spana to produce a website and associated pdf brochure for use by everyone involved in tourism to encourage good practice in several area’s of sustainable tourism including mule welfare. We funded an Ambulance for the village and built an incinerator and instigated a rubbish clearance system. A 5% levy is made on the income of the retreat and handed to the village association (Association Des Basins d'Imlil) and Education For All. 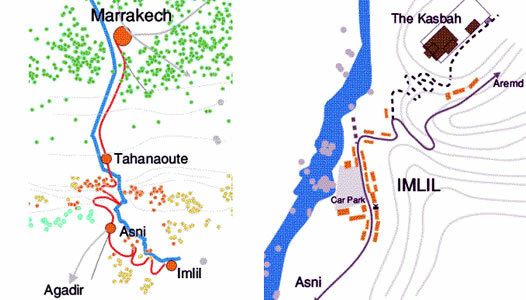 The Association Bassins d’Imlil covers the whole of the surrounding valleys. This association provides the ambulance that you see in Imlil which provides a service to the local population and visitors, other community projects that have been undertaken include the rubbish clearance system and the provision of the village Hammam. Education For All helps provide college education for girls from the rural High Atlas. We believe that changing the world starts with educating young women. So we formed and help support Education For All a charity that helps provide a college education for girls from the rural Atlas Mountains. Because if you educate a girl, you educate the next generation as well. At present, very few girls from rural communities in Morocco continue their education after primary school. The nearest secondary colleges are too far to travel every day from the villages where they live. Their parents are too poor to afford lodgings near to the colleges and the available accommodation is usually over-stretched and often inadequate. Education for All is a Moroccan NGO (with a sister UK Charity) that is building and running girls’ boarding houses near secondary colleges in the High Atlas Mountains, providing the opportunity for selected girls from villages across the region to continue their education. Our first, purpose-built boarding house opened in April 2008 in Asni (45km from Marrakech). In September 2009, we opened a second house in Talat n’Yacoub (100km from Marrakech). 2013 saw the first girls pass their Baccalaureate and go on to University. 2014 saw the opening of our 5th boarding house. Each house has the capacity to provide a "home-away-from-home" for about 36 girls. In 2017 some 200 girls are currently receiving a secondary education that without your support they would not. We want to give girls access to a secondary education and the chance to fulfil their potential in an environment that promotes academic study and social understanding. We can't change the world overnight. But by making a difference to the lives of these girls now, we will change many more in the future. We need your support to continue running these two houses and to progress our plans to build more. To learn more about the project, please visit our website.